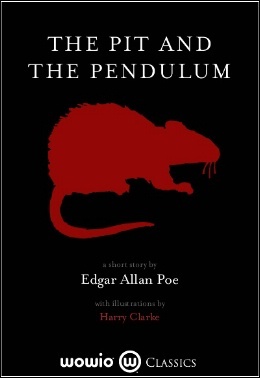 “The Pit and the Pendulum,” a short story taking place during the Spanish Inquisition, is one of Poe’s more famous stories. Less than twenty pages long, it nevertheless manages to convey the horrific fear experienced by prisoners of the Inquisition through the eyes of an unnamed narrator. Waking in pitch-black, the narrator first attempts to discover the dimensions of his prison by walking its perimeter. Eventually, he falls down face first, only to discover he is on the edge of an enormous, deep well, into which he was no doubt meant to stumble blindly. As the story progresses, he endures several more horrors at the hands of his unseen jailors, but never loses his ambition to survive each torture. One of my favorite things about Poe is his unique ability to convey the terror of the narrator. It’s easy, albeit quite unsettling, to picture yourself in the pit, haplessly staggering around—or strapped down as the razor-sharp pendulum descends towards your chest. His dramatic use of sibilants—words like “cessation,” “oscillation,” and “scimitar”—imitates the swoosh of the pendulum as it descends, and his vivid light and dark imagery gives us a perfect idea of what it might be like if we were in that pit. Something else that really got me about this story was how real it was. It never even came close to suggesting these events were in some way supernatural, even in the narrator’s distraught mind, which somehow made it even scarier. To think that people can do those sorts of things to their fellow humans is what’s most likely to keep me awake at night. Not the thought of malevolent spirits coming to steal my soul or aliens intent on vivisection; no, the thought of being at the mercy of another man or woman scares me the most, especially after reading something like this! This is definitely one I’d pick up again, and I would absolutely recommend it to anyone who enjoys good horror stories.